Buy Comcast (CMCSA) Stock on Xfinity Flex &amp; Larger Streaming TV Push? 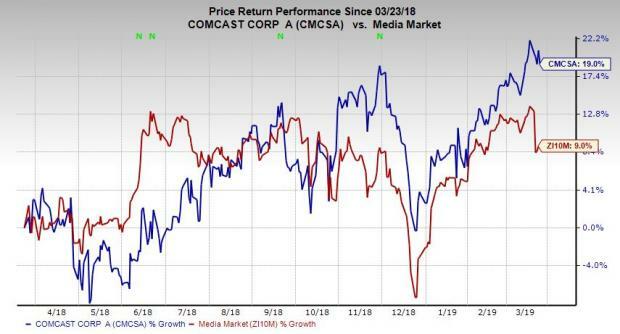 Comcast CMCSA shares have surged 16% this year to outpace the Media Market industry’s 11% average climb. The company is coming off a better-than-expected fourth quarter and just announced a new Apple TV AAPL-style streaming box and service that targets cord-cutters, as part of Comcast’s larger streaming TV push in the Netflix NFLX age. Comcast on Thursday officially announced a new streaming TV offering called Xfinity Flex. The streaming service allows users to watch Netflix, Amazon Prime AMZN, HBO, Showtime, and much more, if they are subscribers, similar to Roku ROKU. The new Xfinity Flex device will cost $5 per month and will be made available to Comcast internet customers. Comcast’s new offering is also set to give users access to “more than 10,000 free movies and TV shows,” along with access to ESPN3 DIS, YouTube GOOGL, and more. The service is clearly geared toward Comcast’s cord-cutting internet customers, but it might also attract some of the company’s pay-TV users who don’t have an Amazon Fire TV, Chromecast, or other such devices that deliver access to streaming services such as Netflix. Comcast’s announcement came just a few days before Apple is expected to unveil its new streaming TV platform. Xfinity Flex is also part of Comcast’s larger streaming TV push as the traditional cable business continues to fade (Buy Apple Stock Up 22% in 2019 Before Streaming Video Launch?). Earlier this year, Comcast’s NBCUniversal unit laid out its plans to launch a free, ad-supported streaming service for anyone that subscribes to a traditional pay-TV service, which includes rivals such as AT&T T and Charter. The service is projected to launch in early 2020 and will feature 1,500 hours of NBC TV shows, like Parks and Recreation, along with hundreds of hours of Universal movies. Aside from the free ad-supported version, non-pay-TV users will be able to pay around $12 a month for NBCUniversal’s streaming service. Along with Xfinity Flex and the NBCUniversal streaming service, Comcast has also rolled out more niche streaming TV offerings, such as GOLFPASS. Meanwhile, CMCSA saw its adjusted fourth-quarter earnings surge over 36% to beat our Zacks Consensus Estimate and its acquisition of pay-TV giant Sky PLC looks poised to help grow both its top and bottom lines going forward. Investors should also note that the company’s cable communication revenue climbed 5.2% to $14.13 billion in Q4, and it lost fewer subscribers—29,000—than it did in the year-ago period. Plus, Comcast’s internet business looks poised to expand no matter what happens because streaming platforms need fast Wi-Fi and internet connections. The company’s high-speed internet unit revenue jumped over 10% last quarter and added 351,000 customers. And Comcast’s relatively new wireless business, Xfinity Mobile, added 227,000 total lines in Q4 to bring its total to 1.2 million. Looking ahead, our current Zacks Consensus Estimate calls for Comcast’s first quarter fiscal 2019 revenue to soar 20% to reach $27.35 billion. Last quarter, CMCSA’s revenues climbed 26.1%, boosted by its Sky PLC acquisition. The company’s Q2 2019 revenue is expected to surge nearly 28%, with full-year revenues projected to pop by 19% to reach $122.43 billion. At the bottom end of the income statement, Comcast’s adjusted quarterly earnings are projected to climb just 1.6%. With that said, CMCSA’s full-year EPS figure is expected to pop 7.8%, with 2020’s earnings projected to jump roughly 11% above our current year estimate. On top of that, the firm’s earnings estimate revision activity has been mixed recently. Comcast is currently a Zacks Rank #3 (Hold) based on its recent earnings estimate revision trends. The company also sports a “B” grade for Value and an “A” Growth in our Style Scores system. CMCSA stock is trading at 14.2X forward Zacks earnings estimates at the moment, which falls below the Media Market’s 18.3X average and the S&P 500’s 17X. Better yet, Comcast has traded as high as 20.3X over the last five years, with a five-year median of 16.9X. Comcast also raised its dividend by 10% to $0.84 a share on an annualized basis for 2019, for a quarterly payout of $0.21 per share. Shares of CMCSA slipped slightly through morning trading Friday, but still rest near their 52-week high of $40.52 per share.